For today’s post (and the next few weeks), I am returning to the core purpose of the blog, to track down the location of my father’s photos. I am in Curzon Street which leads off from the lower part of Park Lane, opposite Hyde Park. 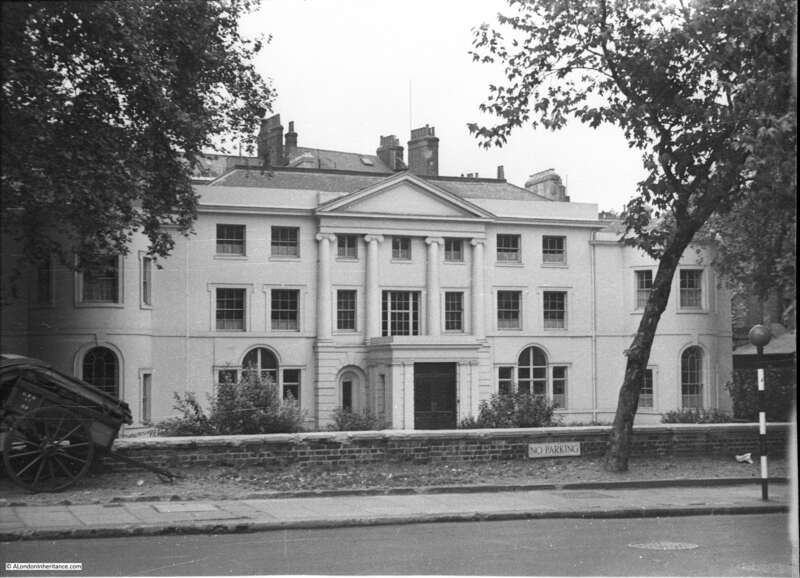 This is Crewe House, Curzon Street in 1953. Crewe House is an interesting survivor from the time when large houses would be surrounded by their own grounds. The original building was constructed in the early 18th century, however it has been considerably modified over time. Today, the building is part of the Saudi Arabian Embassy, and this is the reason why my photo is from a different perspective to my father’s photo. When I reached the building, hoping to take a photo from the same viewpoint, I found a group of rather heavily armed police guarding the front of the building roughly where the cart is in the original photo. Suspecting they would not appreciate being photographed, or being asked to move, I walk a short distance further and took today’s photo. The facade of the building looks much the same, although I suspect internally it has been significantly modified. In 1953 it would have been possible to step over the wall into the garden. Today (in addition to the armed police) railings, gates and CCTV protect the building from Curzon Street. The presence of armed police highlighted another aspect of how London has changed. It is only in recent years that it has become almost normal to see armed police walking the street of London. In the 1970s’ 80s and 90s this would have been the exception. If I remember rightly the first time I saw armed police walking openly it was at Heathrow Terminal 4 soon after it opened in 1986. It was a novelty to see this at an airport and would have been highly unusual on the streets. Weapons were obviously available to the police – they were just not so openly visible. Today, whether guarding embassies, high-profile buildings, or just walking in busy parts of London, this is now a common site. A sad comment on the times we live in that police have to be armed in this way. The building was renamed Crewe House in 1899 when it was purchased by the Marquis of Crewe. Before the name Crewe House, it had been owned for a couple of generations of Lord Wharncliffe’s who also gave the house their name when it was named Wharncliffe House – it has this name on the 1895 Ordnance Survey map. One of the Lord Wharncliffe’s (the Right Hon. James Archibald Stuart-Wortley Mackenzie), died in the house aged 69 in 1846 of suppressed gout which I believe was a catch-all for many possible causes which could not have been diagnosed at the time. Curzon Street has a fascinating history and I had been planning to write about the street in today’s post, however a very busy work week has not given me the time for this, so I will save for a future post, however I cannot finish off a post without a map, and the following extract from John Rocque’s survey of London from 1746 shows the area around Crewe House. Curzon Street runs along the lower part of the map. Chesterfield House was the large and ornate London home and gardens for Lord Chesterfield. The house was demolished in 1937, although the gardens had been built on in the years before. 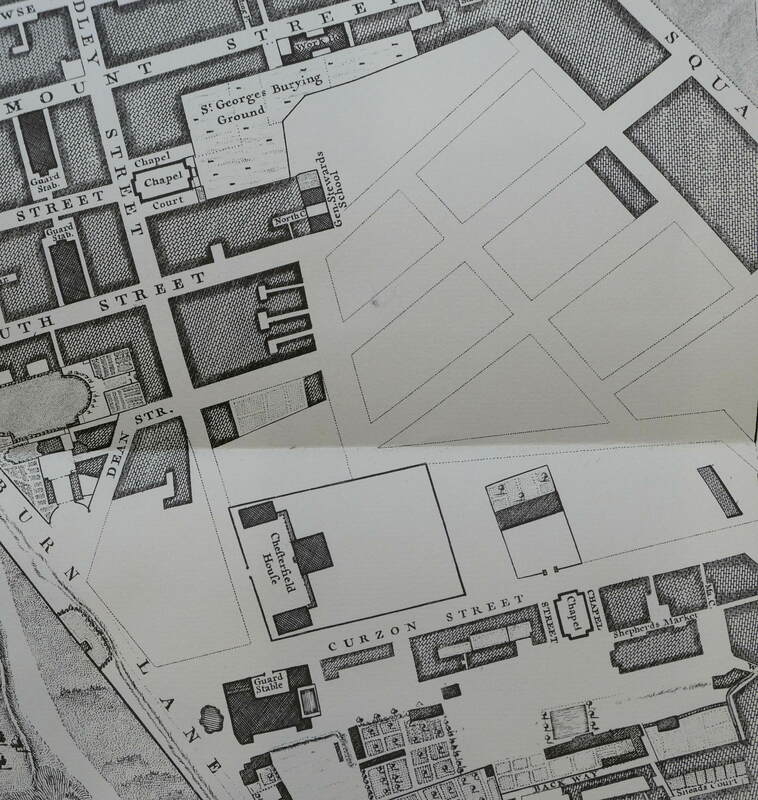 To the right of Chesterfield House is a rectangle with gardens at the top, the dark hatching for a building and white, open space in front. This is Crewe House, and whilst the house has been modified significantly over the years, the layout of a house with large, enclosed gardens to the front, is the same as today. With the loss of Chesterfield House, it is remarkable that the house and gardens of Crewe House have survived for well over 250 years. I will return to Curzon Street, however for the next couple of weeks I have visits to a London pub and a City restaurant planned. This entry was posted in London Buildings, London Streets and tagged Curzon Street on January 28, 2018 by admin. My parents worked for businesses that were part of the Tilling Group, which had Crewe House as its corporate headquarters. I remember Tilling took much pleasure from the building being named “London’s most beautiful house” some time in the 1960s or 1970s. We are regular cinema-goers at the Curzon cinema across the street from Crewe House. I often wondered about the history of the big house so you have now given me the answers. Thanks! The cinema itself is quite interesting, being itself a listed building. In your Rocque map, it is on the corner of the buildings to the left of the chapel. It was originally built in 1933-34 by the Marquis de Casa Maury, who was both an interior designer and a cinema impressario. Demolished in the early 1960s, it was replaced with the current building, the cinema on the ground and basement levels and offices above. The design of the building exterior and cinema interior was to such a high standard that the cinema has been Grade II listed. The cinema is operated by Curzon cinemas, who currently have 13 venues, all named after this one in Curzon Street. I really enjoyed this brief post. As much as I enjoy them – perhaps I’m not alone in struggling to find time to read (and absorb) very long posts. I certainly don’t do them justice when reading the first 2 paragraphs and skirting through the photographs. Thank you for restating your original aim (perhaps I had forgotten) and thank you for your continued dedication to kindly feeding me overlooked cultural delights every Sunday morning. I used to work for Tilling Construction, one of many subsidiaries in the Thomas Tilling Group. Crewe House was the group headquarters and I went there for some meetings in the mid 1970s. Thomas Tilling was the oldest London Bus company and expanded into many other towns and cities. When the buses were nationalised, the group became an industrial conglomerate, still run from Crewe House. I was always fascinated by what must have been one of the most expensive front lawns in London! Oh thanks for prompting a reminder on how grand it is to go wandering in this area on a sunny Sunday afternoon. It’s a very pleasant walk in the streets behind Crewe House, especially Charles Street with its magnificent terraced housing. Number 22 is my fav with its plaque indicating the residence of the Duke of Clarence, later King William IV. It’s good to keep an eye out in case it comes up for sale again. 18b on the corner has been under builders’ wraps for a couple of years now but Google Streetview’s 2008 shots show a beautiful sandstone frontage. Former home of the Portland Club, let’s hope it’s even more handsome after renovations. At the end of Charles Street an unexpected slope leads to the former Red Lion pub. The name is still visible in relief below the roofline. There is a curious house opposite the pub with its upper stories behind a cottagey timber facade. Again, thank you. Looking forward to your return to Curzon Street. Crewe House was leased as residence to two successive American ambassadors – Frank B. Kellog (1924-25) and Alanson B. Houghton (1925-29). Although Crewe House can sometimes be found described as the American Embassy during this period, the Embassy, from around 1914, was located at 4 Grosvenor Gardens, SW1. 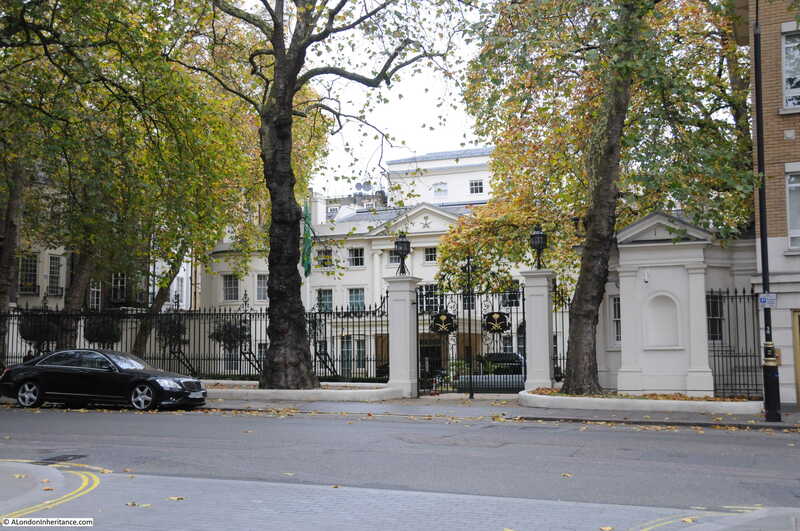 Houghton gave up the lease on Crewe House circa 1926 and moved to 14 Princes Gate, Knightsbridge, where most subsequent ambassadors also lived until Winfield House became the official residence.